The Philippines has been ranked with Palau and Maldives among the world's top dive destinations. 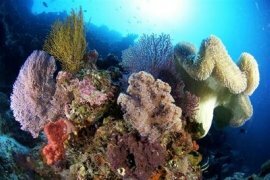 Tourism Secretary Ramon Jimenez Jr. yesterday said the Philippines was named among the top dive destinations and scuba diving trips during the Marine Diving Fair 2012 held recently in Japan. "The Philippines is the only ASEAN country that ranked among the top three dive destinations together with Maldives and Palau," Jimenez said. The tourism chief said that by garnering top spots in major awards and categories during the event, the Philippines was able to affirm its status as a must-see dive destination. "Our partnership with the private sector dive tour operators has paid off nicely. We encourage more suppliers to keep raising the bar for service excellence to grow this market segment," Jimenez said. With five aquariums placed strategically inside the booth and paintings of marine life on the wall, Jimenez said the colorful Philippine booth became a crowd drawer during the event. He said fair visitors went to see the booth to find out what makes diving "more fun" in the Philippines. The Marine Diving Fair 2012 is one of the largest diving and beach resort exhibitions in Asia that attracts over 50,000 visitors annually. According to Jimenez, the DOT participated in the event, which showcased 200 exhibitors from 50 countries, in a bid to maintain the Philippines' status as a premier and competitive dive destination among overseas divers. The participation of the DOT is also in consonance with its overall marketing strategy to attract Japanese divers who, along with the independent ladies and the active seniors, serve as priority segment targets of the department. In 2011, Japan remained among the top three sources of foreign tourists visiting the country. Since its participation in 2000, the Philippines has been continuously selected as one of the top five dive destinations and since 2006 the country has been consecutively included in the top five "Best Overseas Destinations." It has also been consistently awarded as one of the top 10 "Dream Destinations and Scuba Diving Trips."